In the same year, Volta released his discovery of a continuous source of electricity to the Royal Society of London. No longer were experiments limited to a brief display of sparks that lasted a fraction of a second. A seemingly endless stream of electric current was now available. France was one of the first nations to officially recognize Volta’s discoveries. At the time, France was approaching the height of scientific advancements and new ideas were welcomed with open arms to support the political agenda. By invitation, Volta addressed the Institute of France in a series of lectures at which Napoleon Bonaparte was present as a member of the Institute. Figure 1-3: Volta’s experimentations at the French National Institute. Volta’s discoveries so impressed the world that in November 1800, he was invited by the French National Institute to lectures in which Napoleon Bonaparte participated. 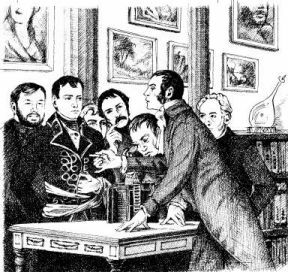 Later, Napoleon himself helped with the experiments, drawing sparks from the battery, melting a steel wire, discharging an electric pistol and decomposing water into its elements. ©Cadex Electronics Inc.
Davy's most important investigations were devoted to electrochemistry. Following Galvani's experiments and the discovery of the voltaic cell, interest in galvanic electricity had become widespread. 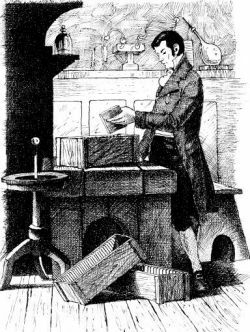 Davy began to test the chemical effects of electricity in 1800. He soon found that by passing electrical current through some substances, these substances decomposed, a process later called electrolysis. The generated voltage was directly related to the reactivity of the electrolyte with the metal. Evidently, Davy understood that the actions of electrolysis and the voltaic cell were the same. In 1802, Dr. William Cruickshank designed the first electric battery capable of mass production. Cruickshank had arranged square sheets of copper, which he soldered at their ends, together with sheets of zinc of equal size. These sheets were placed into a long rectangular wooden box that was sealed with cement. Grooves in the box held the metal plates in position. The box was then filled with an electrolyte of brine, or watered down acid. The third method of generating electricity was discovered relatively late — electricity through magnetism. In 1820, André-Marie Ampère (1775-1836) had noticed that wires carrying an electric current were at times attracted to one another while at other times they were repelled. In 1831, Michael Faraday (1791-1867) demonstrated how a copper disc was able to provide a constant flow of electricity when revolved in a strong magnetic field. Faraday, assisting Davy and his research team, succeeded in generating an endless electrical force as long as the movement between a coil and magnet continued. The electric generator was invented. This process was then reversed and the electric motor was discovered. Shortly thereafter, transformers were developed that could convert electricity to a desired voltage. In 1833, Faraday established the foundation of electrochemistry with Faraday's Law, which describes the amount of reduction that occurs in an electrolytic cell. In 1836, John F. Daniell, an English chemist, developed an improved battery which produced a steadier current than Volta's device. Until then, all batteries had been composed of primary cells, meaning that they could not be recharged. In 1859, the French physician Gaston Platé invented the first rechargeable battery. This secondary battery was based on lead acid chemistry, a system that is still used today. Figure 1-4: Cruickshank and the first flooded battery. William Cruickshank, an English chemist, built a battery of electric cells by joining zinc and copper plates in a wooden box filled with electrolyte. This flooded design had the advantage of not drying out with use and provided more energy than Volta’s disc arrangement. ©Cadex Electronics Inc.